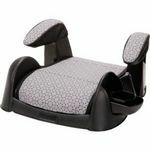 This is a great carseat!! It's comfortable, and convenient!! Honestly over all it's great! 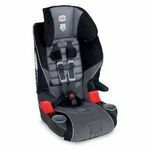 All car seats have a tilting issue depending on vehicle seats. It's angled perfect in the car, the truck it needs to be tilted back a bit. 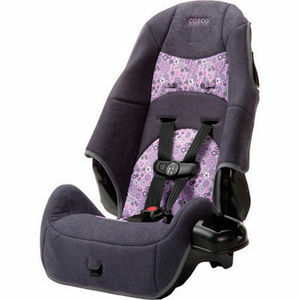 I purchased this car seat for my granddaughter. Her safety was the primary reason I decided on this particular product. Not only was it easy to install but easy to adjust as well. She fits into the seat comfortably and really enjoys sitting in it. Pretty simple and effective booster for my over-sized two year old. It still has the 5 point harness I was looking for, without the bulk of a more expensive brand. Easy to attach and unattach and pretty narrow to fit in the smallest of back seats. Ease of Installation With the latch system, moving it from car to car is a snap. Child's Comfort My two year old loves this car seat. It also him to sit up more to see out the window, unlike his other car seat. 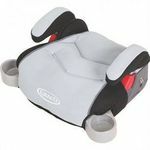 Support and Safety Everything buckles securely and tightens correctly to keep my child safe. Design The design is narrow and great for tight spaces, especially when you are trying to fit three car seats in the back of a compact car. Durability The part look like they will last until my two year old grows out of it. I've had infant versions of the is brand and they lasted for a good long time. The people I handed don my old car seat to says those ones are still going strong, so I would assume the same for this model. I got this carseat because it's made in USA, or at least part of it. Also, it was one of the cheaper in price. What a pain to install! I had my husband do it. It uses little hooks that need to hook on to the bar back behind the seat. So, if you do get this one, get another if you have 2 vehicles. Also, the latch is a pain and it's difficult to tighten the straps. Compared to the infant carseat I had, this was just a pain. Overall, this seat has done the job for us. My daughter was still in her infant seat, but completely miserable because she couldn't see anything and made she we were aware of her discomfort. We picked up this car seat for several reasons. 1. 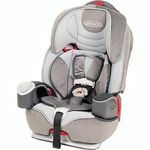 My daughter was only 11 months old (tall for her age and very strong) so we were looking for a car seat that would fit her age and weight. She was borderline weight-wise, but she hasn't had any problems for the two-three months she has now been in the seat and much, much happier. We have a booster seat, so we only need something to get her from her infant seat to about 50 lbs when she can use the booster seat. This one seems to be working great so far. 2. The other aspect we were taking in to consideration is the price. Compared to others that seemed comparable in quality and features, this one was by far much better price-wise. Installation was pretty simple--I think most car seats these days have been designed to install and this was fits the mold. Once home, I had it installed within minutes. There are only a couple knocks on this that I think would have made this a little nicer (which is why I gave four-stars instead of five. 1. No arms on this--would have been a little nicer to had, but wasn't a deal killer for us. 2. The side cup that installs on the side gets knocked off very easily which almost makes it worthless to have. Next models should look at making this stay in a little better. It is nice to be able to move, but it just comes off a little too easy. My daughter likes her bottle, so this is kind of important to us. Overall--I would recommend this product if your looking for something in what you get for the cost--a great deal. Best carseat we have invested in. My daughter is not the average size for her age. When we were deciding on what car seat to buy it was not easy at all. We would see how her head was going to be if she was to fall asleep. How it was going to be installing it. Lots of questions came up. It so happened to be the last store we looked in and last one in stock when we purchased it. Our daughter fit perfectly and she liked how there was her own cup holder. She would not get off of it till we actually bought it. The seatbelt straps were very comfortable, and she was not complaining. The head support was perfect even when she would have her hair done it wouldn't bother her. It's conveniently portable with the bag it comes for traveling. Fits in almost every car we have drove in. Honestly it has been the best find when it comes to safety because the seat does not move even a centimeter when driving or turning. Overall the ones we have seen this was the best one. Ease of Installation Not so many challenging holes to figure out. Ease of Use Very portable, easy bag to use. Overall this is a good booster car seat for toddlers. It's very comfortable to other similar models I'm familiar with. 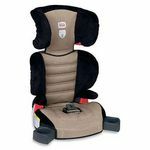 Ease of Installation Like any booster car seat, it fits nicely on the seat, but can be a bit difficult to run the seat belt straps through especially in taller vehicles. I've scraped my knuckles more than a few times. Child's Comfort Good design for toddlers. Support and Safety The safety harness fits well. Be sure to tighten the seat belt when installing to avoid this tiling over in the vehicle. Ease of Use Very user-friendly Design Pretty straight-forward design unlike some seats with more difficult harnesses. One of the downsides is the difficulty of removing the cover to clean it. Durability Very durable through all the spills and everyday wear of an active toddler. I own two and would buy again. I own two seats, both different designs as they sell different ones in different stores and also change up the design every couple of years. My oldest has been in hers for three years now and it's still going strong. She's old enough now to voice an opinion and she has never had any complaints. My youngest was happy to have a seat just like her older sister =) Child's Comfort It isn't the most padded seat, if that's what you're looking for, but I really think adults are more concerned with having padding much more than children are. Support and Safety As long as the seat is securely put in, it doesn't budge. I think the cosco booster is a good highback boosterseat. We have had it for a few years now and it still looks almost like new. It is lightweight and easy to move from car to car as we have to do a lot of carpooling/ shuffling kids around. My daughter likes that it has a built in cup holder. She says it is comfortable even on long car rides. I have washed the carseat material once. It washed well, but just like all of my carseat it was slightly tricky to get it off and back on correctly. This seat doesn't have tons of bells and whistles. It was inexpensive compared to to other seats and I think it has been worth it. It is not fancy, but we have been happy with our purchase. I also think that it is in good shape that her brother will be able to use it next year.